Icelandair says one of its planes made an emergency landing in Quebec late Friday night because of a cracked cockpit window. Harrison Hove watched as the altitude dropped on the live map in the seat in front of him during his flight to Reykjavik Friday evening. Moments earlier, a ding rang in the airplane and two flight attendants darted to the front. The destination on the map had changed, too, but Hove said no one knew why. That's when the pilot announced there would be an emergency landing. "Your mind goes in a billion different directions, like is this a medical emergency? Could we be hijacked? What is going on?" Hove, 34, said over the phone from his hotel room in Saguenay, a city about 200 km north of Quebec City. 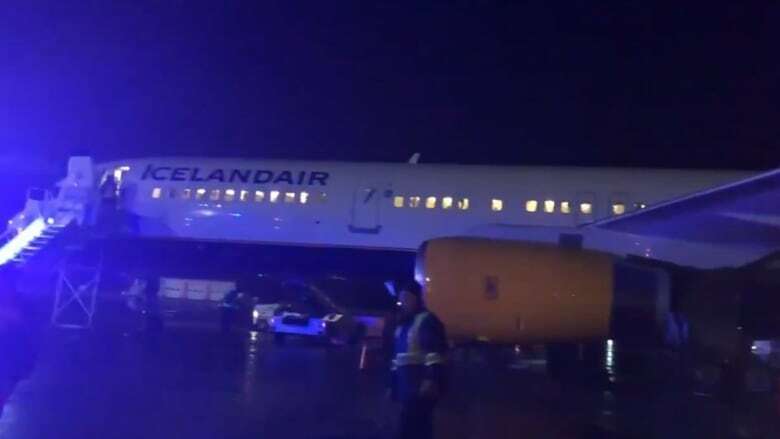 The Icelandair plane made a last-minute landing in a small airport outside of Saguenay at about 11 p.m. Friday because of a cracked cockpit window. Hove says passengers were told the nature of the problem after they'd touched ground. "I could tell on the map it was not Quebec City, but it looked like we were in a very rural area," said Hove, who manages the University of Florida's news stations. "The captain later explained that should underscore the significance of the problem and why we landed immediately." The airline said Flight FI688 from Orlando to Reykjavik was over Canada when pilots noticed the crack in the window. It said the crew followed standard procedure and diverted to a nearby airport in Bagotville. Icelandair said the 155 passengers and seven crew were taken to a hotel to rest. Another plane arrived to pick them up at 8 p.m. on Saturday. Hove, who lives in Florida, was with his mother and her partner on their way to an organized tour through Iceland. Hove says they missed the tour and would only have a few days left in Iceland, so they're trying to find a way to go straight home. For Charlie Love and his family, the flight was supposed to mark the end of a trip. Love, his wife and three teenagers were on their way home to Scotland when the flight made the emergency landing. "It gives them a story to tell about their holidays," Love said, laughing. He said the landing had happened quickly and relatively calmly. "There wasn't very much drama, though clearly it was a concern."